Excuse the pun, but I really like my Roomba. 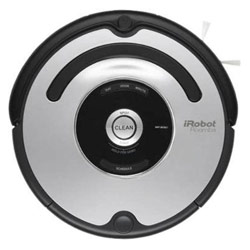 I'd been thinking of buying one for a long while, just to try it out, and then a couple of months ago I happened to notice a refurbished unit (the iRobot Roomba 560) on buy.com at $100 off the new price. So, I thought, why not, plonked the virtual money down and a few days later it arrived on my doorstep. Let me explain. We have four cats (it was only supposed to be three, but then a neighbor had a litter and there was this cute tabby who purred a lot, and the rest is history) and, despite our best intentions, the carpet gets furry and the little blighters tread cat litter everywhere despite buying those special mats that are supposed to help brush their paws as they exit the box. Neither of us has the time or inclination to vacuum every day, but to be honest that's what it needs. Once a week is just not often enough. Hence the thought about getting a robot to do it for us. I recharged the Roomba and pressed the button on the top. I'd given it the biggest level: our lounge plus dining room plus kitchen. After a little trill, off it whirred, vacumming away. Bonk, it hit a table leg, rotated, and went off in another direction. It was fascinating to watch. It found the wall and then tracked along it until, bonk, it hit the sofa. And then, oh mirabile dictu, it went underneath where no vacuum cleaner had ever gone and yet which was a favorite cat hiding spot. After about half an hour, it expired in the middle of the carpet. It was supposed to hunt the docking station and dock to recharge, but not this time. I picked it up, turned it over, and the bin was full. Totally and utterly full, I emptied it, cleaned the brushes, and set it on the docking station again. After it had recharged, I set it going again, only to have the same thing happen. It took in all three runs, before the bin wasn't overflowing and the robot found the docking station properly (another little trill). And that was the story with the three levels I've tried it in (the one mentioned above, the family room and our bedroom/bathroom): the first time I had to make at least three runs before the robot decided that the room was clean enough to dock. After that it was fine. It would vacuum in about 25 minutes and then redock. Finally I was able just to set it going and forget about it: it would find the docking station every time. It picks up dust and fur, no problem at all. Because I work at home, I can move it from level to level once it's recharged (about an hour, but I haven't really timed it), however I'm really thinking we need another to help out. The carpet looks great. In fact, it all looks so good, I now really notice the stairs need vacuuming, which of course the robot can't do. Gaak. The only downside is that the dust/debris bin is fairly small and so really needs emptying after every run. The brushes need cleaning too, but this may be just a function of having four cats (it's their fur that gets wound round the brushes). But I'm willing to clean it afterwards (I've got it down to a fine art now) for the pleasure of heaving clean carpets every day. I certainly recommend it, especially if you have the same kind of situation as we do. As I mentioned above, we're going to go for another one so that I don't have to move it around so much. Maybe a Scooba instead, since we're putting in wood flooring? Roomba is very good, helps me a lot. It have some problems, but generally my apartment is much cleaner that it was before.